With so much news and information out there in the media these days, it can be hard to know what to believe. But if someone asked you to explain the origin of your political and social beliefs, could you provide a thoughtful and complete answer? Could you explain why you believe the way you do? Have You Figured It Out Yet? can help you answer the question. 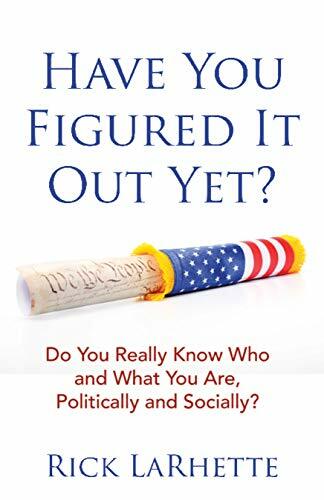 Author Rick LaRhette has figured out the origins of his political and social beliefs by asking a series of tough questions on topics such as political orientation, raising a family, picking your friends, choosing your news and information sources, and knowing about the role of the federal government. He then applies his political and social beliefs to some current hot-topic issues such as immigration, health care, education, global warming, and firearms. It is important to keep asking the hard questions, and if you have ever wondered where your political and social beliefs came from, then Have You Figured It Out Yet? can provide you with some fresh, independent thoughts to chew on outside of media influences.